Michelle Stuart is a multimedia artist working since the mid-60’s, working in every medium from drawing, sculpture, photography, video, installation, to site-specific earthworks. Her diverse body of work is inspired by her lifelong interest in the natural world and the cosmos and desire to connect to it. She has engendered a subtle and responsive dialogue with the natural world, distinct from the epic gestures of contemporaneous Land Art. Recently, there has been a resurgence of interest in her work, and Anna Lovatt, the 35-year-old British art historian and lecturer in Modern and Contemporary art history at the University of Manchester, UK, has organized a show at the Parrish Art Museum in Water Mill, N.Y highlighting six decades of Stuart’s amazingly diverse body of work. The show titled “Michelle Stuart: Drawn From Nature,” will last through October 27, and features Stuart’s drawings and land art projects made between 1968- 2011, but the exhibition does include more than 50 of her sculptural assemblages, photographs and works on paper. Ms. Stuart, who is now 80, has immersed herself in the culture, history and archaeology of different regions, transforming six decades of travel into a lifetime of art. She is inspired by archeology, history, earth and the cosmos. 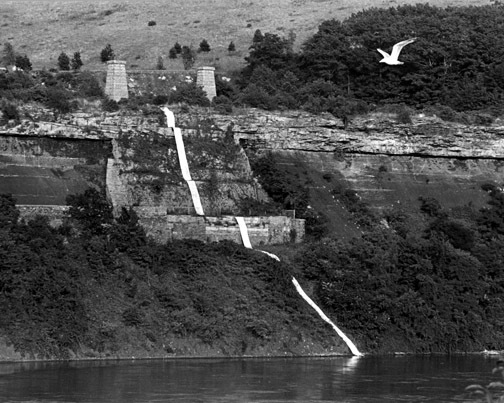 The renowned piece “Niagara Gorge Path Relocated,” from 1975 illustrates the artist’s take on the history of archeology. The work was an immersive project, the 460-foot-long scroll was perforated by smashing rocks into the paper and then unfurled down an escarpment at a spot where Niagara Falls was situated 12,000 years ago. The piece traces history and links the past with the present, and through contemplation retrospectively connects the viewer to a time long gone. Two more highlights from the show are 12-foot-long paper scrolls from in 1973 in upstate New York, their surfaces covered with intricate marks made by placing the muslin-backed paper on the ground and rubbing pencil or graphite across it. The curator Cornelia Butler, who has included her work in drawing surveys at the MOMA and the Museum of Contemporary Art, Los Angeles, said that Ms. Stuart was one of “maybe only a handful of artists of her generation who made a significant contribution during those early moments of land art” around 1970, when mostly male artists like Michael Heizer and Robert Smithson began sculpturing lakes and canyons. Ms. Butler, now chief curator at the Hammer Museum in Los Angeles, points out that not only did Ms. Stuart “incorporate the earth into her drawings,” but she also “brought drawing into the landscape,” as with the Niagara Gorge project. Personally, I am always struck with Stuart’s monumental, labor-intensive scrolls, a series begun in 1970, when she reinvented Surrealist frontage by working with, and against, the earth. THere have been lots of Landscape Artists, and a lot of female landscape artsits put themselves into the work, such as Marybeth Edelson with her “Goddess” photos and Ana Mendieta in series of “Siluettas.” (All from the 60’s-70’s) These kinds of explorations of earth and nature, that subject a woman’s body, are too often unfairly dismissed as “goddess” worship art and primitivism and tossed aside as feminist. unlike their male contemporaries, such as Clemment Greenberg and Carl Andre, are considered to be minimalist and innovative protest against the perceived artificiality, plastic aesthetics and ruthless commercialization of art.Stuart’s photographs, sculptures, assemblages,and scrolls, however, are devoid of a human figure and so escape the feminist stereotype. For some reason her style reminds me greatly of Agnes Martin despite how massive and grand they can be. A lot them are still very thoughtful and I think the quality of her works that appeals to me most is how personal they are despite how far back towards the past, or high towards the stars they reach.